Dr. Snider and his highly-trained staff are committed to providing patients with the very best care dental available. By using state-of-the-art technology, we’re able to make your treatment time faster and your experience in the office more comfortable. Intraoral cameras are tiny digital cameras that fit comfortably in your mouth and enable Dr. Snider to show you an enlarged image of your teeth on a computer screen. The camera is located in the tip of the intraoral wand and transmits real-time video for you and Dr. Snider to review. Dr. Snider uses a small, hand-held device to screen his patients for oral cancer. The device is used to detect various types of pre-cancerous conditions and is performed by shining special white, blue fluorescent and amber lights inside the mouth to detect unusual and abnormal tissue growth or lesions. Screenings are done with painless light and take just minutes to complete. Dr. Snider employs the latest laser technology to perform corrective gum procedures without surgery. His special diode laser is designed for the soft-tissues of the mouth. Diode lasers are used to correct “gummy smiles” and to even out the gum line. Dr. Snider uses digital X-ray technology in his practice. Digital X-rays have 80% less radiation that traditional X-ray machines and are more comfortable for patients. Because there is no need for processing film of the image, Dr. Snider can review your X-rays within seconds of taking them. 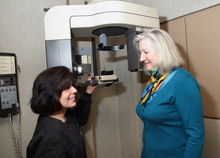 Using the latest technology, Dr. Snider has a Digital Panoramic X-ray machine. This type of X-ray gives Dr. Snider a broad overview of your entire mouth, showing the teeth, upper and lower jawbone, sinuses, and other tissues of the head and neck – all in one X-ray. The X-ray is so sensitive that otherwise hidden or deep cavities will show up as well as gum disease. 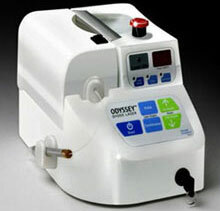 Dr. Snider employs laser technology to screen for early signs of tooth decay. The DIAGNOdent laser is a pen-like probe that sends a safe, painless laser beam into the tooth and checks its health. An alarm will signal when there are signs of hidden decay. The DIAGNOdent allows Dr. Snider to catch tooth decay at an early stage before the tooth is destroyed from the inside, which can prevent more extensive procedures later on. The CariVu device is a compact, portable caries detection unit that uses patented transillumination technology. 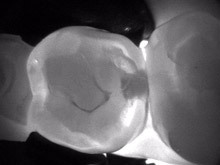 This helps Dr. Snider identify cavities, including in difficult to see areas, such as between teeth.